Landscape Construction: We specialize in stone patios, pathways, retaining walls, decks & railings, fences & gates, pergolas, flower beds, sodding, grading, planting and so much more. No matter the size of your project, Assiniboine is equipped to do the job. Property Maintenance: We service residential, condominium and commercial properties. Our services include weekly and bi-weekly lawn care, vacation cuts, hedge and tree pruning, bed maintenance and fertilization. We also offer Spring and Fall clean up packages to start and end the season right. Snow Removal: We service both residential, condominium, and commercial properties. Our crews use everything from shovels, scrapers and snow blowers to skid steers, power brushes, snow plows, sanders and dump trucks to ensure the safety of our clients. Our namesake peak is considered one of the most beautiful mountains in the Canadian Rockies. 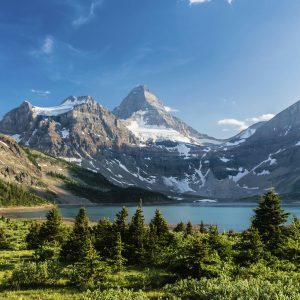 Nicknamed “the Matterhorn of the Rockies,” the 11,871 ft Mount Assiniboine is easily identifiable from the top of most mountains within a hundred kilometers of it. 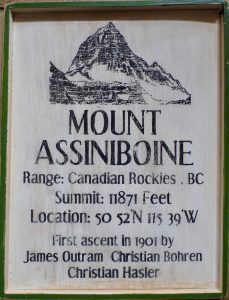 The peak was first climbed in 1901. We take inspiration from the beauty of this area.